For those who have travelled and those who travel on a budget, a 2018 Cosmos Vacation provides not just the best in budget travel, but also the best in promotions! 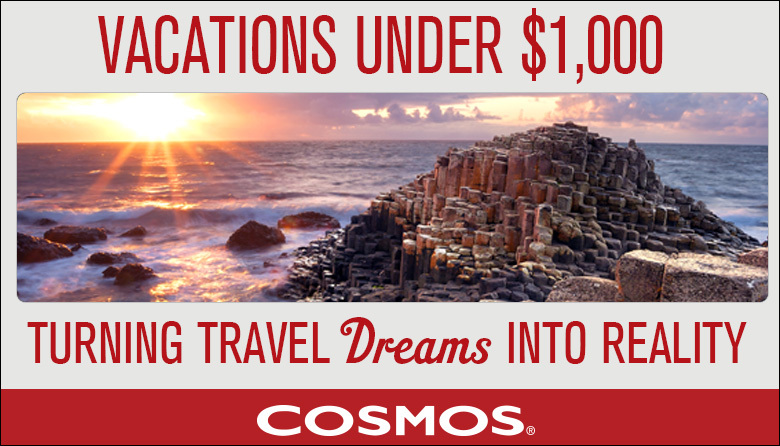 Booking a 2018 Cosmos Vacation NOW will result in savings of $50 per person off the cost of the land price. If you're traveling alone, a 2018 Cosmos Vacation will provide you with $200 off the single supplement of that particular tour. SOLO TRVELERS ALSO SAVE! For 2018 there are nine vacations all under $1000 see what your choice are! * The "Starting at" or listed price is based on the lowest price available to book. Price is per passenger based on double occupancy and does not include airfare; additional fees/charges are not included. If a price is crossed out, the new price includes a limited time promotional offer(s) â?? please review current promotions or deals for additional information. Some tours require intra-vacation flights (and in some cases intra-vacation segments must be purchased from Cosmos).